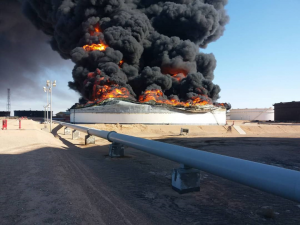 The damage caused by the oil crescent fighting that started last Thursday will lose Libya billions in oil revenue the NOC said (Photo: NOC). Libya’s National Oil Corporation (NOC) announced yesterday that the fighting that erupted last Thursday at the country’s eastern oil crescent will cost Libya ‘‘billions’’ in lost oil revenues. It confirmed the loss of storage tanks 2 and 12 at the Ras Lanuf port terminal following Thursday’s ‘‘armed assault by militia’’ in the Oil Crescent, led by former Petroleum Facilities Guard (PFG) local commander Ibrahim Jadran. The fighting and destruction has resulted in a 400,000-barrel reduction of crude oil storage capacity (from 950,000 barrels to 550,000 barrels). Prior to the attack, Ras Lanuf operated five crude oil storage tanks. The destruction of tank 2 is in danger of leaking and spreading the blaze to reservoirs 1, 6 and 3, the NOC reported. The NOC also confirmed that one oil employee was shot during the incursion and a number of other employees were robbed by a number of ‘‘African armed mercenaries fighting alongside the Jadran militia’’. All other NOC employees were evacuated to safety on Thursday, it confirmed. The NOC repeated its call for the immediate withdrawal of Ibrahim Jadran and his ‘‘gangs’’ from the port, and the cessation of military operations and the provision of support and assistance to fire-fighting teams trying to reach the tanks still ablaze. This incident, the NOC said, will result in the loss of hundreds of millions of dollars in construction costs, and billions in lost sales opportunities. Rebuilding the tanks may take years, especially in current security circumstances. It said it applauds the heroes who are risking their lives to save the livelihood of the Libyan people. Meanwhile, the Libyan Red Crescent reported that 28 dead bodies were received from the fighting.